Drill Rush in Super Smash Bros. for Wii U. Drill Rush (ドリルラッシュ, Drill Rush) (formerly named the "Triple Dash") is Meta Knight's side special move. When used, Meta Knight leaps sideways with his blade outstretched. If he hits an enemy, he performs a combination lasting up to a good 2 seconds, knocking Meta Knight's opponent upward. Also, when finished, he pulls back a bit. Meta Knight can also change the course of the attack, as he is shown using the same attack upward, allowing it to be used as a recovery. The attack hits 10 times, 1% damage for each hit. After using the attack, Meta Knight becomes helpless. It is possible to cancel the ending lag of the attack by making the end hit the edge, allowing it to be virtually lag free, and allowing it to be used to rush opponents in such stages as Battlefield. This is known as Drill Rush Canceling. Of all of Meta Knight's recovery moves, this move gives the most vertical distance. In Super Smash Bros. 4 the move has added startup lag, and Meta Knight now rebounds off surfaces upon impacting them near the end of the move. In midair, he'll perform a small jump just before charging forward during the initial delay. Connecting on targets with the final hit that produces the knockback will have Meta Knight recoil a bit backward for safety, but this recoil jump will not occur if Meta Knight does not hit an enemy, unlike the version in Brawl. Also, the move connects more reliably and it is much stronger. "Spin into opponents with your sword. You can change the angle a bit." "Faster than Drill Rush, but the angle can't be changed." "A Drill Rush designed to break shields. Attack power and distance are reduced." High-Speed Drill: Increases the speed and distance of the move, but unable to change the trajectory and reduces knockback from the attack. In Super Smash Bros. for Nintendo 3DS, this variation is a Challenge unlock, only obtainable by winning at least 5 Smash battles with Meta Knight. Shieldbreaker Drill: Much more shield damage, but reduced knockback and range. 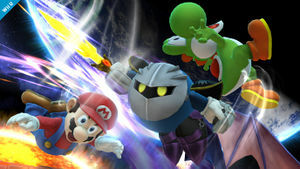 High-Speed Drill being used in Super Smash Bros. for Nintendo 3DS. Shieldbreaker Drill being used in Super Smash Bros. for Nintendo 3DS. Challenge board unlock image for High-Speed Drill. Kirby using Drill Rush in Kirby & The Amazing Mirror. Drill Rush originates from Kirby & The Amazing Mirror, where it is available to Kirby as the Dash-B attack of the Master ability, the ultimate Copy Ability of the game which is granted by Galaxia, Meta Knight's sword. It also somewhat resembles the barrel roll he does for a Quick Spin attack in Kirby Air Ride. Drill Rush in Super Smash Bros. for Nintendo 3DS. Drill Rush as shown by a Skill Preview in Ultimate. If Meta Knight uses Drill Rush while he is under the effect of a Timer and the opponent isn't, the move will deal up to 30 hits with a maximum amount of 30% damage. This page was last edited on March 10, 2019, at 03:28.